I caught up with Andria Hutchins at Luncheonette for breakfast yesterday where we chatted over some delicious granola and coffee and I got to ask her some questions about her enterprise Revolution. I grew up in the Dandenong Ranges, east of Melbourne and my parents both were very involved in the various social struggles of the 1970s (anti Vietnam War movement, women’s rights, worker’s rights), so I have early memories of poking my head through a banner at May Day marches and of grown ups discussing feminism and politics from a very early age. My Mum and a few of her friends set up and ran a women’s refuge and childcare program in the outer eastern suburbs for a while, and I remember having a great time playing with kids in this secret, special place where we weren’t allowed to tell anyone where it was, and many years later finding out about the stories of the women and children there. When it came to my career, I studied journalism and ended up in some great jobs in marketing and public relations, mostly in the community sector, and with a focus on promoting Australia’s engagement with the Asia-Pacific region. I was head of PR and communications for the Royal Melbourne Hospital, Australian Volunteers International (for which I led media visits to Cambodia, Vietnam, Thailand and Indonesia), ABC Radio Australia and the Queen’s Baton Relay for the Melbourne 2006 Commonwealth Games, which took me to Buckingham Palace for the start of the relay and to Pakistan, India, Sri Lanka and all Commonwealth nations of Asia. After that I moved to Singapore to take up the role of Public Affairs Director with the Australian High Commission. I had been there in 2003 as an Asialink Singapore Australia Young Business Ambassador. I went there single and expecting to be back in two years, but returned seven years later with a two year old and my partner, Hanafiah. What led you to start Revolution? I have always been a fan of recycled fashion and love trawling op shops and pre-loved designer stores whenever I visit a new place. I was living and working in Singapore and became involved with UN Women (where I served as a volunteer editor and executive committee member) and NorthLight School, a local secondary school for students with special needs. I ran a few pop up events selling donated designer clothing for these organisations, originally as fundraising events but ended up getting the NorthLight students involved and saw how much impact we could make by providing a supportive environment for real life training for these young people. The teachers told me many students had difficulty adjusting to the world of work and work experience placements had often left them feeling less confident and more uncertain about their futures than before. The Revolution pop ups raised more than $10,000 for the school’s needy students fund and for Sanctuary House, a local charity that provides crisis accommodation and care for at risk babies and children. 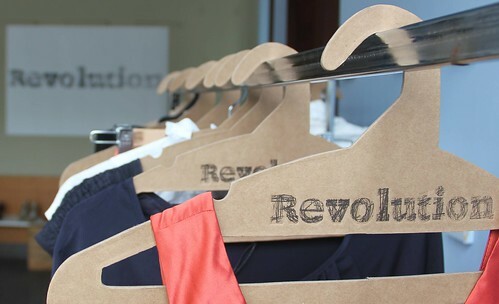 The school ended up incorporating the Revolution pop up events into its retail studies curriculum and we provided training and employment for 64 students. When I left Singapore, I donated the stock and fittings to a charity op shop that supports a shelter for women and children affected by domestic violence and arranged for the NorthLight students to be involved in occasional pop up events, so the spirit of the partnership continues in some way. When I moved back to Melbourne late last year I was struck by how much the city, and my local area on the inner west, had changed in the seven years I had been away. Perhaps because of my experience with Revolution in Singapore, I became interested in the plight of young people in the area who were having trouble finding work. I became involved in a volunteer mentoring program for marginalised young people, run by the Moonee Valley and Maribyrnong councils and saw how there was a strong need for something like Revolution here; to provide young people who have left school before year 12 and are having difficulty finding employment with a space to build confidence, and personal and work skills, whilst earning income and receiving accredited training. So, Revolution came to Melbourne. I started talking to people about it early this year and in a very short time had enough stock crammed in my garage to open a store. And then the idea became a reality in July, when we were offered a vacant retail space at Docklands thanks to the Docklands Space project, which is supported by City of Melbourne, Places Victoria and MAB Corporation. What do you sell at Revolution and where do you source them from? 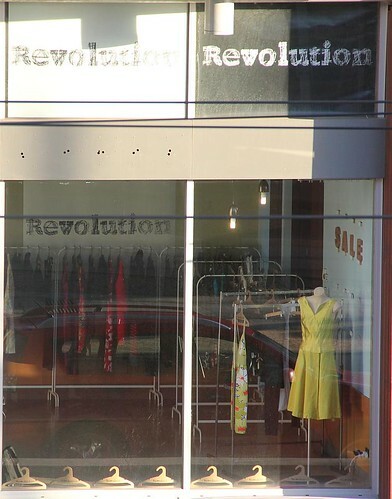 Revolution sells pre-loved designer clothing and accessories, and we also stock some new items kindly donated by the local fashion and retail industry. The initial stock came from friends and family and complete strangers who heard about the project. People have been incredibly generous with their support. 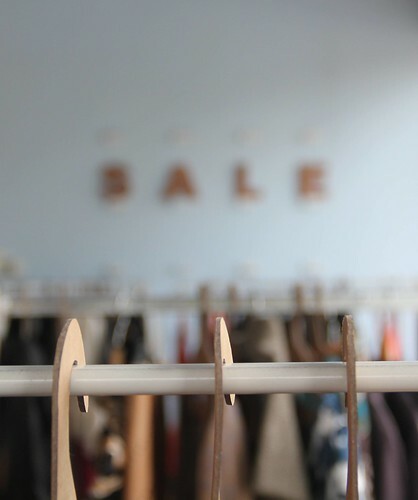 We now mostly receive stock from clothing drives conducted by large organisations, but lately we’ve been approached by some shops that are closing down and want to donate stock, including a pre-loved designer fashion boutique, and have recently also received a large amount of left over stock from a one day charity sale. Individual people also drop in with clothing donations from time to time. You provide employment for long-term unemployed youth, can you tell us a little more about that? More than 27 per cent of Australians aged 17-24 were not in full-time study or work in 2011. That’s more than a quarter of our young people. And, when you consider that these are people are at the beginning of their working lives, this paints a fairly bleak future for them, their families and the communities in which they live. While more than a quarter of this country’s young people are still not fully engaged in work or study after they leave school, the figures for people from disadvantaged backgrounds (particularly those from families on low incomes, Indigenous youth, young people with a disability or health problem) are staggering, with more than 40 per cent of young people from these backgrounds not working or studying. Changes to the structure of employment, with less apprenticeship opportunities available to early school leavers and a trend towards more casual and less full-time, permanent employment only adds to the challenge of finding work and starting on a career pathway for long-term unemployed young people. What kind of impact do you hope to have? Revolution Project has been set up specifically to deal with the issue of long term unemployment amongst young people, aged 16-24. Our social impact will be measured in the number of hours of training and employment we provide to long-term unemployed young people and, most importantly, their ability to secure and maintain ongoing employment once they complete the program. What has been the most challenging part of starting your own business? There are so many challenges when setting up any new business. For me the hardest part was knowing where to start, as I don’t come from a background of small business owners. But I found there are plenty of people out there happy to help if you just ask. The Victorian Government has a business mentor program, which enables me to spend sometime talking with people who had heaps of experience in setting up businesses and gave me lots of great advice. I also have a fabulous mentor that checks in with me regularly to keep me on track and give me lots of great feedback and advice, thanks to the School for Social Entrepreneurs, where I have recently completed a Social Entreprise Accelerator program. What does a typical day at Revolution look like? There is no typical day at the moment as there is so much to do. Sometimes I start off with meetings with potential donors or partners, or I may go into the shop and work with our staff to photograph stock and list items on our website, serve customers or even spend some time talking through some personal issues they may be facing. There’s lots of problem solving and discussions in that space. Do you have any advice for people wanting to start their own social business? I don’t think I am in any position to give advice to anyone, but there are plenty of people out there who can, so that would be my suggestions I guess … open your eyes and look at what is out there in terms of free advice and support for new businesses. Look at business start up and business mentor programs offered by your local council and state and federal governments,talk to people you know who have started a small business and even those you don’t know, you’d be surprised how helpful people can be. 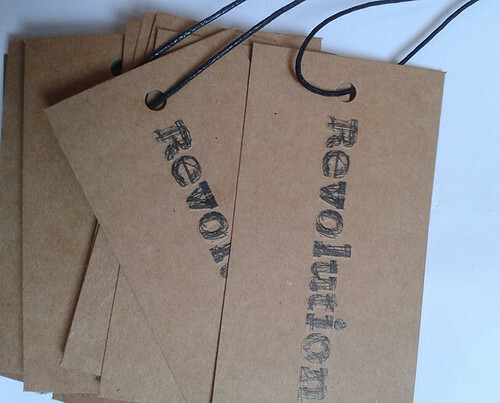 You can check out the Revolution website here and their Facebook page here.